​​READ and LISTEN The Official Highway Code. Valid for the 2019. Start to use the app for free and unlock all features and full content for £5. 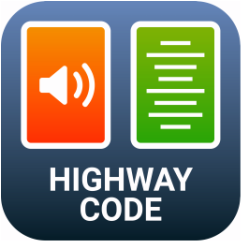 You can read or listen all the topics of the Official Highway Code at your convenience. You don’t need to carry the book with you anymore. The Highway Code applies to England, Scotland and Wales and is essential reading for every road user. Applies to pedestrians, cyclists, motorcyclists and horse riders as well as drivers. This app contains all the latest content from The Official Highway Code, reproduced under the terms of the Open Government Licence, so you can be confident that you’re revising from the most up-to-date information available for UK road users. Many of the rules of the Code are legal requirements and you may be fined, given points on your licence or disqualified if you don’t obey them. In serious cases you could also be sent to prison. It is most useful for those who prepare for the theory tests. LISTEN – Select chapter, listen, mark bookmarks, view your progress and learn on the go. PROGRESS – Keep a track of your learning using the automatic built-in progress monitor. DOWNLOAD SIGNS AND MARKINGS - Refresh your knowledge of all the latest traffic signs and road markings included in The Official Highway Code. Disclaimer: The UK government is not responsible for the accuracy of the contents. ​Very helpfull, you can see your progress and even listen on your phone. Question: It crashes sometimes. I purchased the audio files and not all have been downloaded. When I click on a missing one it crashes. Answer: Please wait a few minutes till all the files download. If you still can not play audio it can be because of not enough free memory space on your phone, please check. Question: I paid for the full version but I'm not getting it. Can you please advise. Answer: Maybe app was damaged while downloading. Please try to uninstall Highway Code app and try to instal it again. You do not need to pay second time. When cklick on paid chapter and on "Restore" button. Files will be downloaded to your phone.